CULLMAN – St. Bernard stayed at home Thursday and took on the Athens Bible Trojans, with the junior varsity boys starting things off. The first quarter was a low-scoring one and the Saints went into the second period down 7-4. Connor Berry nailed a trey to make it a 9-7 game early on in the second, but Athens Bible went on a couple of mini-runs to slowly pull away from the Saints and took a 22-13 lead into the locker room. Druss Hays looked to jump-start the Saint offense as he scored five straight points to make it a 22-18 ballgame, but the Saints couldn’t get any closer as Athens Bible pushed its lead to double digits, 37-23 at the end of the third. The Saints couldn’t recover and wound up falling 43-30. Hays led the way for St. Bernard with 13 points and six rebounds. Berry finished with eight points and three steals. Jongha Park ended up with six points, three rebounds and a steal. Peter Tran added three points and a rebound. The Saints fall to 1-1 overall on the season. The first quarter was a turnover-filled one, but the Lady Saints were able to take a 9-6 lead into the second period. St. Bernard increased its lead to 14-7 on a Bridget Gallegos three-pointer and an Emma Tafazoli layup. After Athens Bible made it a 14-10 game on three free throws, Claudia Fallin drilled a three of her own. Jackelyn Arteaga and Tafazoli each added a free throw to make it a 19-10 St. Bernard lead going into the locker room at the half. The Lady Saints stretched their lead to 28-16 after three quarters and wound up keeping the double-digit lead for the rest of the game as they pulled away to win their first game of the season. Tafazoli had a huge game for St. Bernard. She finished with a double-double, scoring 17 points and collecting 11 rebounds. She added six steals as well. Fallin ended up with seven points, eight rebounds and a block. Gallegos added six points and two rebounds. Macy Whaley finished with five points, four rebounds, two steals and a block. Helen Kim added four points, four rebounds and four steals. Arteaga finished with a point and three rebounds. 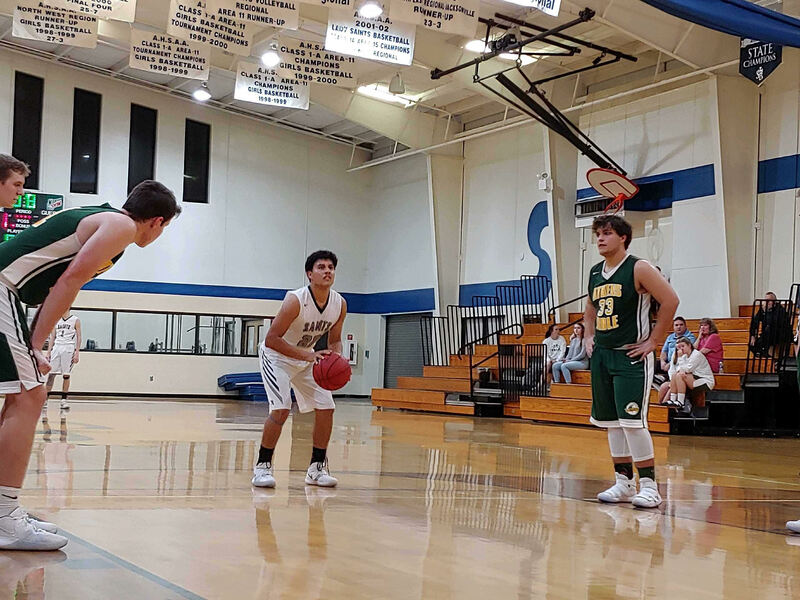 The Saints quickly fell behind, 6-0, to start the game, but they answered right back and then some as John Rose converted a pair of and-ones at the free-throw line. Carson Holmes finished with five points and Jose Zatarain added four points of his own. St. Bernard’s defense completely shut down the Athens Bible offense for the rest of the period and the Saints took a 13-6 lead into the second quarter. Holmes made it an 18-8 score with his second three-pointer of the night, and after Athens Bible made it 18-11 with a trey, Rose went on a run of his own. He scored the next seven points of the game to help stretch the Saints' lead to 25-12 and they went into the locker room up 30-19. Gavin Whaley and Rose each hit a layup to start out the third period for St. Bernard to stretch the lead to 34-19. Rose later scored five points in a row to make it a 42-24 lead, but Athens Bible finished the quarter strong, scoring the final seven points, including a shot before the buzzer sounded; the Saints saw their lead get cut to 11 at 42-31 after three. Athens Bible continued its run into the fourth quarter, scoring the first seven points of the period to make it a 42-38 game, but the Saints were able to calm down and got back on track, pushing their lead back to 11 at 49-38. Two quick threes from the Trojans made it 49-44, but St. Bernard sealed the win at the line as Rose and Zatarain each hit a pair of free throws. Rose finished with 26 points, five rebounds and four steals for St. Bernard, which improve to 2-0 early on in the season. Holmes ended up with 11 points, three rebounds and a steal. Zatarain added eight points and a rebound. Alex Shoaff ended up with six points and four rebounds. Gavin Whaley finished with two points, eight rebounds and two steals. David Kim added five rebounds and a pair of steals. Holmes ended up with three rebounds and a steal, while Peter Duan added a pair of rebounds and a steal. St. Bernard will not play again until next Thursday, Nov. 15, when the Saints travel to Vinemont. The junior varsity boys will get things started at 4:30. Copyright 2018 Humble Roots, LLC All Rights Reserved.